St John of God Murdoch Hospital recently hosted a series of artworks from the senior and emerging artists from the Waringarri community in Kununurra. Manager Arts Program Connie Petrillo said the works were a vibrant addition to the hospital environment and not only worked to create a healing space, but were a great way to engage with remote communities in WA. “By showcasing the work of contemporary Indigenous artists, we can tell their stories and support their communities,” said Ms Petrillo. Established in the early 1980s, the Waringarri Aboriginal Arts centre was the first wholly Indigenous-owned art centre in the Kimberley region. 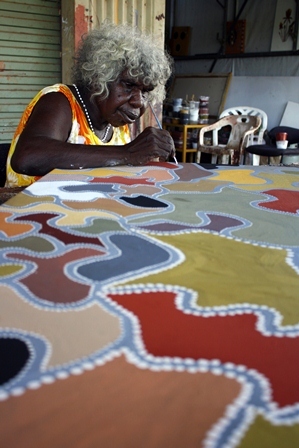 It supports more than 100 artists and employs local Aboriginal people as arts workers. The Indigenous Artists Commission Series is a part of the hospital’s Reconciliation Action Plan which is aimed at building relationships with Aboriginal people and Torres Strait Islanders and to work towards closing the gap in life expectancy, specifically in the area of health care.